2015-08-04 All of you guys who think focus-follows-mouse is the natural way to interact with a windowing GUI, possibly combined with auto-raise (which is the variant I prefer), will know that MS-Windows has for a long time now offered the "XMouse" option first through its TweakUI add-on tool – which goes back all the way to PowerToys for Windows 95 –, then from Windows 7 on through the Accessibility Settings in Control Panel. There is also the very recommendable command-line utility XMouse.exe which is easy to compile with every normal .NET Framework installation, which is actually needed on Windows 7 to achieve pure focus-follows-mouse, as that setting is not offered by A11Y options. So for all you guys using pure focus-follows-mouse – you can move on, nothing interesting for you here. Auto-raise enthusiasts, stay put. Ideally, the tool would be some minimal C# hack which compiles on every machine where the .NET Framework is available, just like XMouse.exe does. Sets a low-level hook on the mouse pointer to be notified of pointer movement. On movement, checks the window under the pointer with WindowFromPoint, combined with GetAncestor to find out about the corresponding top-level window. 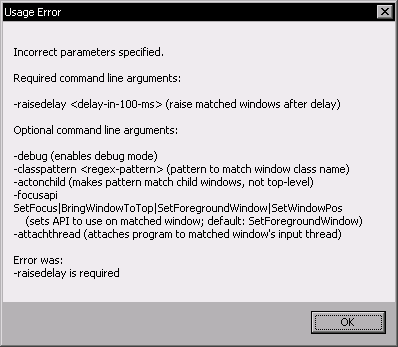 In case the top-level window under the pointer matches a preconfigured class name, starts a configurable delay counter. Once the delay counter hits its target and the pointer has since not left the window, raises the window with a configurable API call (default is SetForegroundWindow). The -debug argument makes the form stay visible and display class names of the windows under the mouse cursor, so start the tool once with that argument and some bogus values for -raisedelay and -classpattern to find out about the class name pattern you need to invoke the tool with. You can also use utilities like Window Detective to get that name. This is in particular necessary if you want to change the settings of the program or otherwise need to restart it. It is generally not recommendable to run multiple instances of it in parallel. While they won't necessarily get in each other's way, it's just a waste of resources.